A summary of today’s show: Scot and Fr. 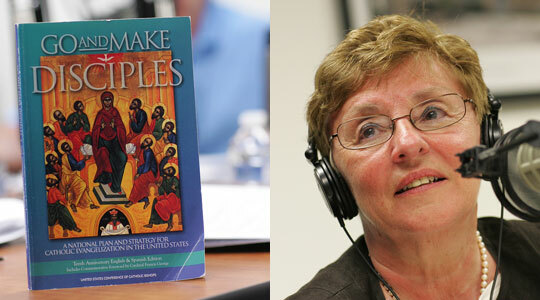 Chris talk to Janet Benestad about evangelization and the strategy put forward by the US bishops in their document “Go and Make Disciples”. 1st segment: Scot welcomes Fr. Chris back to the show. Last Wednesday, Fr. Chris helped with the graduation of the Master of Arts in Ministry program. There were 16 graduates. Bishop Dooher gave the commencement address and he talked about evangelization. He told them that what they learned there, they now have to spread to others. Some of them are working in parishes, one is a Boston Symphony Orchestra member, and another is a chemist. It shows that the work will be done not just in parishes but in homes and places of work. One of the 16 is the hundredth graduate of the program. Laypeople and deacons formed at the heart of the Church. Fr. Chris has also been with the men at Norfolk state prison, who are always listening to the show. Fr. Chris celebrates Mass. Sometimes he will also speak afterward. He will also hear confessions. Scot said there is now a Boston Bruins flag flying outside the Pastoral Center today in honor of the Bruins playing in the Stanley Cup finals against the Vancouver Canucks. Walking through Boston yesterday, he saw a Bruins flag at City Hall and the State House, so he’s happy to see it here. Fr. Bryan Parrish, who works in the Pastoral Center, said the flag was donated by one of his parishioners. It’s a great time to be a Boston sports fan. 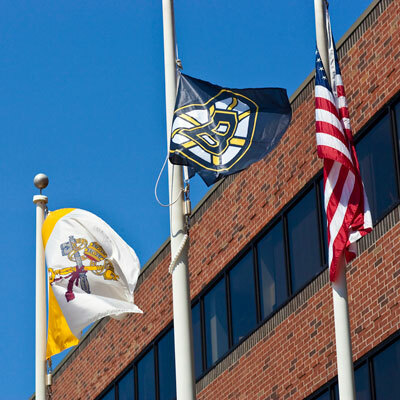 Scot pointed out that the flag flies between the Vatican flag and the US flag, temporarily replacing the Massachusetts state flag. 2nd segment: Scot and Fr. Chris welcome Janet to the program. Janet has been at the archdiocese for several years and before that in the Diocese of Scranton. She started in Scranton 12 years ago in a similar role, overseeing religious education, youth and young adult ministry, prison ministry, hospital ministry, cultural diversity, and more. Her secretariat was reconstituted prior to her joining her team because Cardinal Seán had wanted a new focus on evangelization and faith formation. Janet said both parts are vitally connected. Faith formation helps people come to know Jesus in a systematic, while evangelization is a broader effort. It helps people understand that everything they do is connected in some way to the love of God. Fr. Chris said the great gift of the Eucharist is God’s abiding presence. In coming to Eucharist and hearing the Word of God proclaimed we are sustained. We can’t give what we don’t have and how can we share if we don’t know Jesus. Evangelization often has a sour taste in the mouth in our culture. It’s too often described as proselytization, which is forcing the faith on others or manipulating. Janet said to be a witness is to not engage in propaganda, but to be a living mystery, to live in such a way that life would not make sense if God did not exist. It is the message of Jesus Christ, given in the Gospel and preached with conviction and all of the power of the Holy Spirit. Scot said Henri Nouwen’s definition is “one beggar leading another beggar to the bread.” The person who evangelizes doesn’t have all the “food”, all the answers, but knows the way. You just have to lead people to Christ. Fr. Chris said it complements the idea of the Body of Christ, that there’s no one person who can communicate all of the faith to another. This is why we have all the saints, who shared the faith in their own way, just as we do. The word some basic words in our faith. Evangelium means Good News in Latin. We are passing on the Good News handed to us by the Apostles and disciples and successive generations. Janet said in the early days of the Church there were no seminaries, no parochial schools, no Catholic colleges, no CCD. The faith was alive in the people who had experienced it directly from Jesus or the Apostles. We don’t keep good news about movies or restaurants or the like to ourselves, but we hesitate to share the most important good news. The Holy Spirit came upon the Apostles on Pentecost and they couldn’t help but share the Good News, despite the fear they had been under before that. Scot said if we think we’re not capable of being evangelizers, if we need more courage or understanding, we can pray to the Holy Spirit for those gifts. Fr. Chris said another image is the lamplighter. The lamplighter lights one lamppost at a time and soon the whole street is alight. We can be like the lamplighter to our family and friends. About 20 years ago the US Bishops Conference issued a document on evangelization. It says that evangelization is both inward and outward. Janet said in order to evangelize one has to grow deeper in the faith, to pray, to become active in the community. That’s the first step of evangelization. The document says one reason for evangelization is so that people can experience the grandeur with which they are made. Fr. Chris quoted John XXIII: The goal for every person is to get to heaven and bring as many people with us as we can. We have to become holy ourselves. People should know we are Christians as soon as they interact with us. Ghandi said he would become a Christian if he ever met one. Scot said God created each of us with a unique set of gifts. Every person ever created has a unique set of gifts and God has an eternal destiny and a purpose for using those gifts. By being connected with that, we will increase our sense of joy and love in this life and the next. 3rd segment: We witness to Christ by our actions, by willing to talk about it in any way we know, and by asking or inviting people to join with us in our faith. Scot said the outward direction of evangelization comes the great commission of Jesus: Go and make disciples of all nations. This is the name of this document. Janet quoted Fr. Mark O’Connell in a homily saying to children that they can be evangelists. He told them that when they go to school on Monday and talk about their weekends, tell others they went to church. Everyone is called to evangelize. Every person has a story of faith. Tell that story. Articulate it as best you can and then live it in everything you do. Fr. Chris added that forgiveness is an important element. When we forgive it’s a response to God’s forgiveness for us. All of the components of our live are opportunities to evangelize. How many times is there an opportunity to show God’s love and mercy to people we encounter every day. Scot said people tell him they don’t evangelize because they fear or have received a hostile reaction. Certainly nearly everyone who has evangelized has received such a reaction at one time or another, even Jesus. Fr. Chris said, looking at TV, people have no problem exposing the craziest, most intimate details of their lives, yet we fear to reveal who we really are. Pope Benedict XVI has established a new pontifical council to promote evangelization. For many years, the Church saw evangelization as going to foreign lands that have not heard the Gospel, but today we have to re-evangelize ourselves. Pope Benedict says every Catholic should buy a catechism and know what it says. The Pope has said we need to use all the forms of media to get the message out. Then build on the things that have worked to spread the good news. Scot asked Janet for ideas to overcome fear of hostility to our witness. First, remember it’s not an argument or debate. Lead people to love. Second, listen first before speaking and preach through the actions of your love and concern. When a person leaves the Church, our concern for them does not end at the church door. Our concern for them lasts beyond their hostility. It can be a kind word or gesture and care and charity. Recognize that the person’s soul is in a process of conversion. Scot had interviewed Fr. John Corapi and was struck by the humber of men who had come back to their faith because of his talks. Fr. Corapi said it’s up to the Holy Spirit to convert. Our job is to invite. Second, pray for the person we’re inviting and then praying after the invitation. Third, connect them as much as possible to the Church. Don’t stop trying, but don’t force ourselves on them. Let them know we really care for them, we want what’s best, and we’re not pushy. Fr. Chris said we have to be able to say, “this is why my faith is so important to me.” Be ready to give a defense of our faith in three sentences. What’s essential about my faith? Why is it important to me? Scot said God’s plan of salvation includes us being a vessel of reconciliation and invitation. Men who think about the priesthood often think of all their flaws that would prevent them from being a good priest. Yet it’s our flaws which others could see in us which makes our faith seem accessible. God chooses the weak and makes them strong. The first goal includes many programs of renewal and conversion, particularly our rite of Christian initiation programs. Pastors have been telling Janet that people in the parishes are growing deeper in their faith as a result of Catholics Come Home. Scot said this document does a great job at explaining what evangelization in the big picture, to express the goals, and then to get very granular in giving tactics for how every parish and family can experience this renewal. Many of these have to do with the Sunday Mass. Fr. Chris said the Mass is one of the principle places we go to be renewed with the Lord. The document talks about encouraging Eucharistic adoration and about sacramental preparation. The Church re-introduces us to our faith in the preparation, even if we’ve baptized other children already, for example. Scot focused on the suggestions for the domestic church. adaptation of new and meaningful faith practices within the family in view of the decline of family prayer. Janet said some people don’t quite know how to live the Christian faith together with their family. Start by praying together as a married couple. Then when children come, pray with them, and get them used to the idea that spiritual life is not something we do in private, but which we do as a community. Scot’s brother, Fr. Roger Landry, says his best seminary was the domestic church of his home where he learned so much of his faith. Fr. Chris said he heard about kids who write to the bishop about their confirmation sponsors and how often it’s someone in their lives who have witnessed to their faith. It’s all the little moments of passing on the faith, taking the opportunities that are there. It takes effort to carve out time for prayer, but how will we know Jesus if we don’t. Janet said many of our parishes have become more welcoming through Catholics Come Home, creating ministries of welcoming, putting explanatory and welcoming materials in the pews, making the churches more accessible to those who might be uneasy about coming. As institutions become more aware of their Catholic identity, they become better witnesses to a culture that is somewhat hostile to them. Scot said many Catholics leave the Church for evangelical churches because they are welcomed there, by joyful people. There are too many Catholic parishes where someone could attend every week and no one would ever know their name or speak to them. Fr. Chris noted that the Pastoral Center is open every weekday for Mass at noon and on Thursdays for confessions, which is welcoming. The Church has a lot to offer the culture. Janet said the document is forward-looking on Catholic social teaching. We respect the dignity of the human person which is a fundamental teaching of our faith. Every Catholic is called to bring to every part of their life the mindset of a Catholic, the Christian idea of society founded for the common good. Fr. Chris recalled Pope Benedict saying even for someone who doesn’t believe, it’s better to follow the Ten Commandments because everyone’s rights will be protected. Scot said the third goal encompasses the corporal and spiritual works of mercy.